Touma is narrating that he is so misfortunate, when a bird flying over head drops one on him. He reflects back over the past week of the Daihasei. Apart from saving the world from Oriana, on the second day he walked in on Komoe whilst she was changing her clothes. Immediately after her speedy recovery, Seiri had head-butted him. Whilst visiting hospital, he was hit by a rubber ball which was thrown by Aisa in her wheelchair. 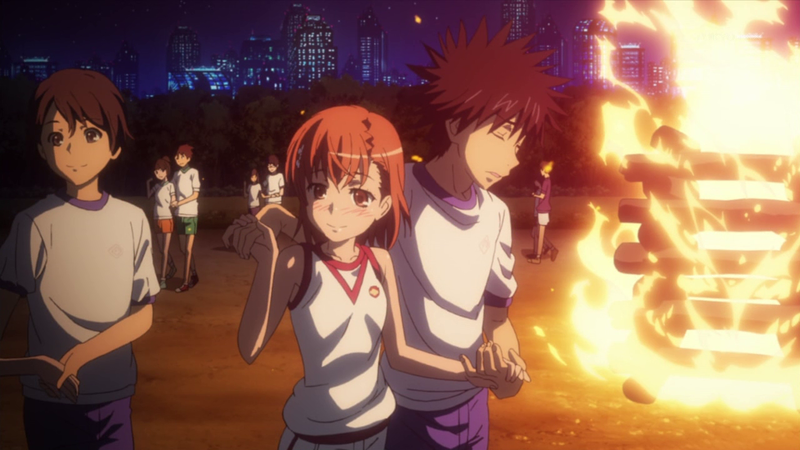 The bet between Mikoto and Touma; with Mikoto winning, ended up Touma forced to participate in a folk-dance with her. However, Kuroko kicks him moments later. This is topped with the constant biting attacks from Index; he thinks he is the most misfortunate person. Before he can finish the statement, a bell is rung and the woman announces to him that he chose the winning number in the Daihasei lottery and he has won a trip for two in Northern Italy. Touma is packing his suitcase for the trip, but realises he hasn’t got a passport. Feeling unlucky with the holiday in two days with no time to apply for one, he unpacks and finds his passport. Index tells him she has one and hands it to him. Looking through it he finds that Index has not even had it stamped; even from entering the country. She wonders that if she has her passport, would she be able to go on the trip. Touma thinks this trip may turn out to be a good thing. 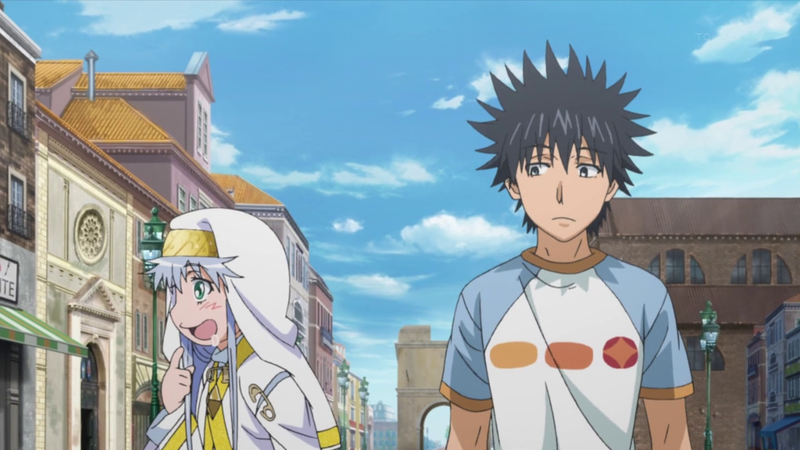 Touma and Index arrive at the airport; with Touma worried. Index reassures him it will be ok, this makes him realise that they are going on holiday and they should enjoy themselves the next couple of days. However, Index is stopped by two guards whilst going through the metal detector. She had set the alarm off due to her many safety pins that hold her “Walking Church” in place. For this, Touma runs out of the airport with Index heading to the shopping area; 1.5km away in order to buy clothes for Index. With only 28 minutes to catch the plane, Touma screams that he has so misfortune. They both arrive in Italy, taking in the scenery whilst walking. Although Touma still had the misfortune of having to look for spare safety pins and their tour guide left them in Italy, they still manage to make it to their destination. Index then starts drooling at the sight of all the restaurants and food. Touma tells her that they have to drop their luggage at the hotel before they eat. Index angrily tells him she knows. Touma then goes on to tell her that he wants to go to Venice and have a ride in a Gondola, but when he turns round Index has gone. 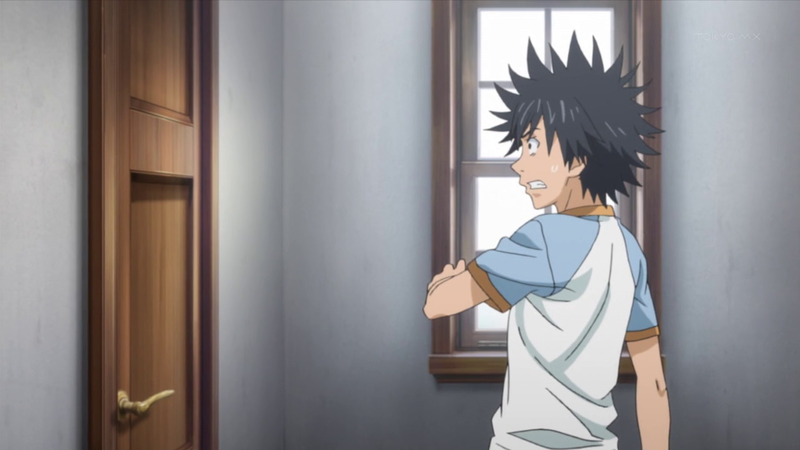 Touma starts searching for Index but fears that he may become lost himself. Just then, a lady comes over to him and starts talking to him in Italian. Fumbling through an Italian dictionary, Touma struggles to reply. Suddenly, a familiar voice speaking in Italian tells the lady that he is a friend of hers. The voice belongs to Aquinas Orsola, who tells Touma that she saw him in trouble and helped him out. Walking Aquinas tells him that she has been in Italy for several days and is moving her belongings to her new home; assisted by the Amakusa Church. She tells him that it is perfect time for him to help her move. Touma feels that he should find Index first, but Aquinas tells him that it isn’t a problem. In Aquinas’s house, Index is stuffing herself with a huge tub of gelato. Aquinas tells him that she found her stuck in a gelato shop and asked a friend to bring her back to her house. 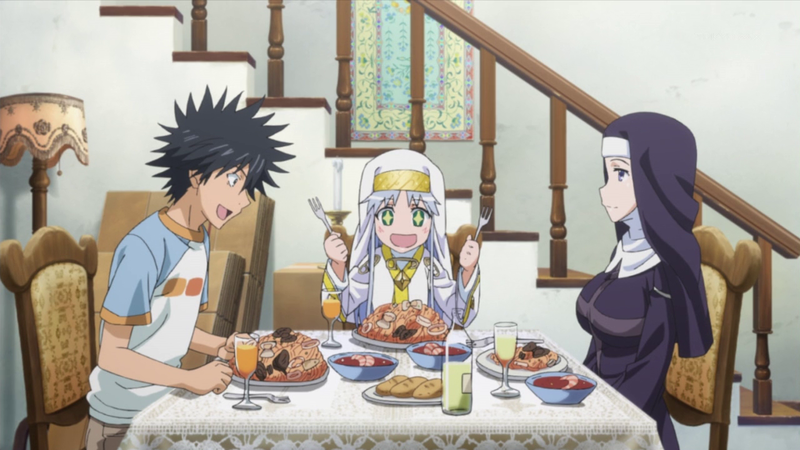 Just then, Index pauses eating and asks Aquinas when is dinner. This shocks Touma as Aquinas tells her it would be soon. In the doorway, some people are looking at Touma and whispering about him and his connection with Aquinas. Their gossiping ends with them describing Touma as a monster. Is it me or has Index got 2 forks? Later, Touma and Index sit down to lunch with Aquinas. Touma is offered a wet towel by one of the Amakusas, still trying to figure him out. 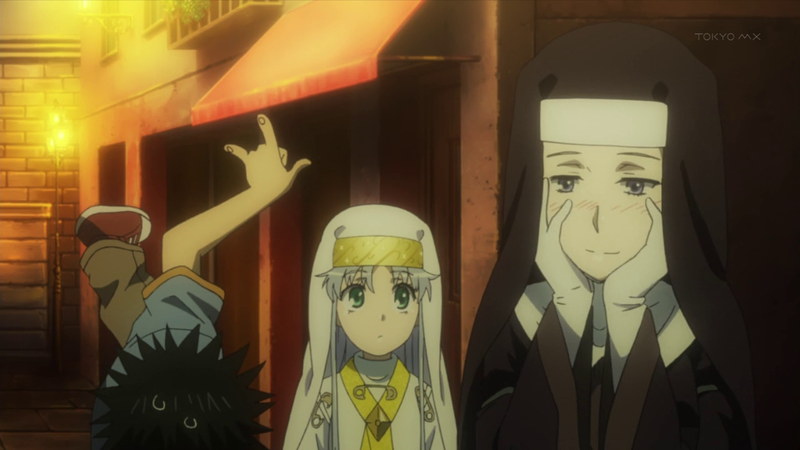 Index; who had been drooling over the food in front of her shouts at Touma. Aquinas tells them to starting eating, which they do and they find delicious. Aquinas suggests to Touma to visit Venetia, Touma asks Index but she has her mouth full. Later, Touma helps out Aquinas move her stuff onto the removal truck. He heads back inside to start packing the plates. He calls to Aquinas for newspaper, which she replies it is where she is. Touma heads in her direction and comes across two doors. He is about to open the left door, but then hears running water and a female humming. He stops as he believes that the door leads to the bathroom and someone is in there. He turns to open the other door, but again hears the same thing as the first door. Struggling to decide what door to open he deduces that he should open the door on the right. Upon opening the door, he realises then that he could have just knocked, as the expression on his face suddenly changes. It turns out he has open the door to the bathroom and Aquinas is having a shower. She notices him staring, there is a long pause before Touma runs back into the corridor. Just then, a yelp is heard from the other door over hot wind coming from a strange rod. Index comes rushing out and removes her towel, revealing herself naked in front of Touma. Touma is dumb-struck and wonders why there are two bathrooms. Aquinas tells him that one is reserved for religious purposes and the other for daily use. Index tells him that he should apologise for seeing someone naked. Touma tells her he was searching for the newspapers when Index attacks him. Later, they finish packing the truck and it heads off. Touma asks Aquinas to join them, but Aquinas declines as she tells him that they will be heading to their hotel and there will be too many people. This makes Touma fall to the floor with Index puzzled; Touma tells her she doesn’t need to know. They part ways, after Aquinas invites them to her apartment in London if they are in the neighbourhood. Touma returns the favour if she is in Japan; with Index bring up Touma needing to clean his room. Suddenly, Index senses something and shouts for everyone to look out. She then uses her ability; “Spell Intercept” to divert an attack which hits Aquinas’s suitcase, knocking it out of her hand. Touma then notices magic pointer; aiming at Aquinas and dives at Aquinas pushing her to the ground with the attack just barely missing Touma. On the ground, Touma is then suddenly thrown into the water and the attacking man exits the water and proceeds to stab Aquinas with a spear. However, Index uses her ability to turn the blade in on itself and the spear shatters. Touma quickly exits the water and punches the attacker. Touma is concerned for the sniper, but Index reassures him that her ability would get to him. Suddenly on the rooftop, a figure stands up and calls for the ship adding that they will kill the woman on aboard. Suddenly, the ground starts to shake and a huge ship rises out of the river. The ship is too big for the river that the floor’s edge breaks and Touma with Aquinas are taken up on the side of the hull with the ship as it rises. Index is however, thrown aside. Touma tells Aquinas to climb into the ship for now. The ship then starts to move and heads out to the open sea, knocking down a bridge over the waterway. Touma doesn’t think that jumping into the water would be a good idea at this height. A group of people in hoods are ordered to search the ship for them. Touma suggests to Aquinas for them to hide until they can escape. Below deck, Touma wonders what is going on when they hear footsteps above them. The both of them enter a cabin to hide; Touma recognises the attackers as of the Catholic Church and believes that it involves the book of law. However Aquinas tells him that it should have been resolved when she converted. 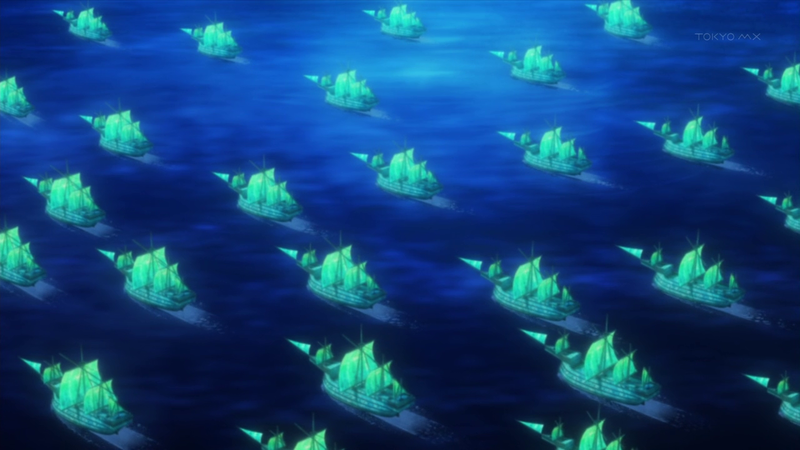 Suddenly an explosion is heard from outside and they both look to see a huge fleet of ships rising from the sea. Just then the door of the cabin starts to turn. Touma quickly hides Aquinas under the bed sheets and goes to lock the door. The door opens to reveal Sanctis Agnese. An exciting episode, filled with plenty of action and humour. 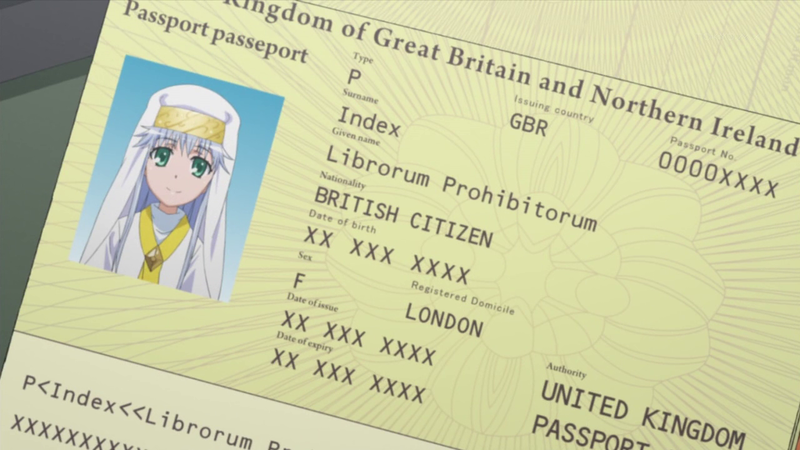 Funny that Index is a British Citizen, a holder of a British passport – not stamped. That is fine, as long as she stays away from metal detectors… We have also a new ED theme and new credits to go with it. It is a nice catchy tune, but need time to get use it, probably listen to the full version before I give my personal opinion of it.